Emergency rescue workers carry a victim on a stretcher after the Dharara tower collapsed on April 25, 2015 in Kathmandu, Nepal. More than 6,200 people have died as tremors hit Nepal after an earthquake measuring 7.9 on the Richter scale caused buildings to collapse and avalanches to be triggered in the Himalayas. The Nepali government was caught unprepared to deal with tragedy that arose as a result of the earthquake. By and large, the public, as well as the government, recognize that they should welcome most Chinese, Indian, as well as international aid. Xi Jinping and the Chinese leadership announced immediately after the quake that China would be sending a specialized search and rescue team, medical supplies, and the kinds of relief assistance that China has some expertise in. This all has been welcome by the Nepali people and government. Similarly, the Modi government in India responded in a quick and significant manner, including several helicopters for transporting goods to areas that need them the most. It seems that the primary motive of all countries offering aid after the earthquake is humanitarian. I always tell my friends that because of the complex history of the region, India will continue to play a significantly higher role in Nepal. But what amazes me is that if you look at Nepal with its population of about 30 million or so, the level of Chinese engagement with Nepal, at one of the most sensitive parts of its border, is actually quite small if you compare it with China’s engagement with a similarly sized country in Africa. In some ways, China is beginning to realize that perhaps they did not pay proper attention to their engagement with Nepal, which is important for their own interests in the geopolitical landscape. It’s unfortunate, but to some degree understandable, that the Nepal government declined Taipei’s offers of post-quake aid to maintain a strategic distance from Taiwan. On a people-to-people level, especially in light of an influx of Chinese tourists coming to Nepal, the prospects for better understanding between Nepal and China looks promising. Nepal and China have a shared history of over 2,000 years. There were times when our ties were not as robust as they are today. After the founding of the People’s Republic, Nepal and China established a formal relationship in 1950. It was limited and reasonably steady. The relationship has grown, however, since 2006, when Nepal became an independent democratic republic. This coincided with China’s modern economic rise and its aspirations to play a bigger regional role. At the same time, some 300 million middle class Chinese began to travel. Chinese now comprise one of the largest groups coming to Nepal. Some adventurers are curious about what lies on the other side of the Himalayas; others search for the birthplace of Buddha. Chinese have a lot of curiosity about India, but India to them is still far more foreign than Nepal. Many Chinese who travel first to Lhasa then want to go to Nepal. Nepal also is a very special ecological and environmentally important space. Chinese are beginning to understand that most of their native rivers, including their “mother river,” the Yellow River, originate in the Greater Himalayan region. As the debate in China about pollution increases, people will begin to see the Himalayas and Nepal as an important space they must learn more about. The Nepali public has a favorable impression of Chinese, formed toward the end of the Cultural Revolution when China helped build roads. Nepalese remember Chinese workers as hardworking, honest, simple-living people. China’s aid today is seen as positive because it’s focused on infrastructure development, an area in which Chinese seem to have done a good job. In recent years, I have become concerned about increased Chinese involvement in Nepal’s hydro-power sector. In the haste of addressing energy needs and making quick money, we all have to be extremely carefully about the ecological and safety issues around building hydro-projects. This is important because the Himalaya are young mountains and experience high seismic activities, which cause serious earthquakes like the one we had this past Saturday. In terms of significant shifts in trade and exchange, it is interesting to note that up until about 10 years ago, most building materials, from windows to faucets, used to come from India, a two- to three-day drive away. But now, a significant amount of the construction material in Nepal comes from the Guangzhou area, and can take up to 15 days to arrive by road. Nepalese are getting more choices in terms of quality and pricing. Meanwhile, Nepalese often view Indians, with whom they have close historical, cultural, religious, and linguistic ties, as big brothers. It’s a complex relationship that has elements of intimacy and mutual respect and at the same time contains a significant amount of suspicion and tension. Many talk about this in terms of a somewhat insensitive big brother dealing with a significantly weaker younger brother. Nepalese know very little about China. Very few people speak Mandarin, but that has begun to change. After 2006, material goods—everything from clothing and toothpaste to cheap statues of the Hindu gods Shiva and Ganesh—began to land in Nepal from China, replacing goods from India. These statues manufactured in a place that is seen as not that spiritually inclined, occupy very private and spiritually important spaces in people’s homes. All of that makes Nepalese wonder what China is all about. 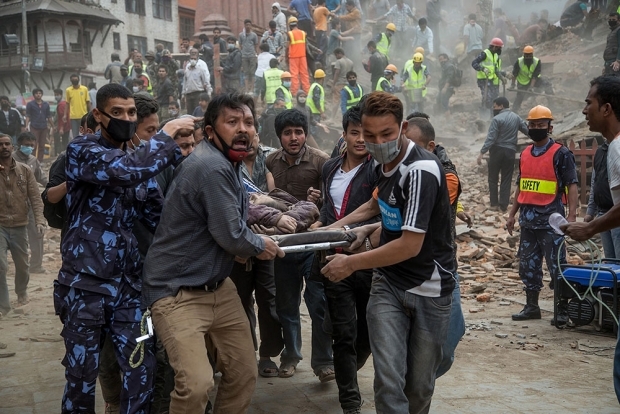 A powerful earthquake jolted Nepal, one of the poorest countries in the world. Landlocked between China and India, Nepal naturally receives large amounts of emergency aid from its two neighbors. Rapid and effective aid is what counts, in the immediate wake of a major disaster in any country. Care needs to be taken, meanwhile, to minimize the impact of “secondary trauma”—i.e., quake victims being inundated with disorderly provision of aid materials. With limited transportation infrastructure linking its outside world, Nepal can be expected to be going through a difficult transition from rescue to recovery. Narratives are quick to settle in, some calling Chinese aid efforts to Nepal a practice of “disaster diplomacy.” Well, the quake also caught hundreds of tourists from China off guard, in addition to afflicting physical and human damage in parts of Tibet. So, a good part of the Chinese response is to meet expectations and even the demands of its own nationals. Again, transportation is a formidable bottleneck, keeping in check any desire to show off capacities. Some early estimates put the cost of the quake to Nepal to be around 20% of its GDP. Let’s hope the actual damage is going to be less severe. In any case, post-quake reconstruction is the logical follow-up task to ponder. Being landlocked high up in the Himalayan mountains, Nepal does not offer much attraction to international private capital. Even its famed mount-climbing tourism has a limited and, in many ways captive, markets to tiny streams of adventurers. Hence, genuine assistance to help the country recover will have to come in the form of mostly grants, keeping concessionary loans to be bare minimum. The prospect of countries, especially China and India offering grants to Nepal, for better or for worse, does fall into the framing of competition for “soft power.” A more sensible way, however, is to focus on letting the people of the country decide the pace of reconstruction and how foreign assistance can fit in. I, for one, do not see Nepal as being significant in China’s “One Belt and One Road” initiative. A critically important question in thinking about relating to Nepal in its post-quake construction is how not to see that country fall into a debt trap. Nepal’s fear of getting things wrong in its relationship with its powerful neighbor in the North is such that even in this time of crisis, it cannot afford to ignore what China terms its “core interests”. Hence its refusal of official aid from Taiwan, which has the resources and experience of dealing with such devastation. Nepal also warned the Indian army rescue team not to fly near China’s airspace—although the area most affected by the earthquake and most in need of emergency relief is precisely the border area between China and Nepal. The responses of both China and India to the relief work have been laudable and timely—within six hours of the earthquake the Chinese government had dispatched an emergency task force to Kathmandu and the border regions, even though the earthquake also devastated Tibetan areas within its own borders, allowing China to speak of the event in terms of a mutual tragedy and a shared experience. China has been one of the major donors of aid to Nepal for decades. Since the 1960s it has been, along with India, one of Nepal’s main sources for infrastructural development. But it has benefited from a far more positive perception among the general public than has India. Particularly among the Nepali elite, China has a positive image not because of aid but because it has replaced India as the source of sought-after goods. Its consumer products are penetrating every level of the market from refrigerators to cellphones, and almost 100% of cellphones sold in Nepal are Chinese-made. Among social media users, China’s Wechat system is the most popular means of communication among Nepalis. While a few decades ago the view from the Nepali side of its border with Tibet was that the Tibetan side was poor and underdeveloped, today it is just the opposite: the Nepal side of the border is visibly poorer both in terms of living standards and in infrastructure, while Tibetan areas have benefited from China’s economic development and government investment. Despite China’s aid and its cornering of the market in luxury and other goods, the Nepal-China relationship remains almost entirely confined to the government and the elite. There is hardly any people-to-people contact between Nepalese and Chinese. The earthquake in Nepal did not arouse a wave of public sympathy in China, unlike the mass support and concern conveyed in India, where there have been public vigils in multiple Indian cities, and a Sikh Gurdwara in Delhi is said to be dispatching cooked meals every day through the Indian airforce. The earthquake was hardly discussed on the vibrant social media in China, and there was no rush among the public to collect donations to send to Nepal. India has an open border with Nepal. Millions of Nepalis work in India and some groups along the Himalayas feel their home to be both in India and Nepal. There is hardly any Nepali family which does not have members living or studying in India. There is also the shared and familiarity of Hindu culture. Compared to this, China remains a distant and alien culture and society for most Nepalis. Although the shared experience and familiarity between India and Nepal has not created a uniformly positive image of India among many Nepalis, and has often been greeted with suspicion both by the elite and the public there, it is a contempt bred of familiarity. It is China’s distance and remoteness that has earned it a positive, even awe-inspired image among its southern neighbors. By “changed,” he likely meant that China has become more willing to project its power, particularly in terms of helping citizens abroad. China has become more willing to project its power, particularly in terms of helping citizens abroad. For years, many Chinese social media users have pooh-poohed the Chinese passport, as an increasing number of middle class tourists feel inconvenienced by the lack of visa-free arrangements with countries that are popular tourist destinations. That may be changing. In a viral post shared on WeChat, a popular mobile messaging app, in the aftermath of the Nepal earthquake, an anonymous author wrote that “the Chinese passport may not be able to take you to a lot of places, but it can take you home from anywhere.” On April 27, the Weibo account of state paper People’s Daily waxed poetic about “Chinese planes arriving first above ruined buildings [in Nepal] and Chinese naval ships keeping their promise in the midst of gunfire [in Yemen].” The Chinese navy evacuated about 600 Chinese citizens, mostly workers with state-owned companies, from war-torn Yemen in early April 2015. It was the second such large-scale operation after China extracted more than 38,000 workers from Libya in 2011. The Chinese media played up the fact, with some glee, that the U.S. government refused to extract its own citizens from Yemen.—This post is an excerpt of a story first published by Foreign Policy.